It did feel strange to walk back into a regular store to shop for the weekly groceries. One of the things I did over the summer and fall was that I bottled a lot of summer goodies. 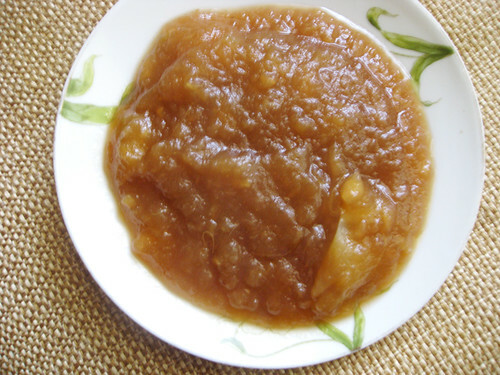 I made curry sauce, applesauce with apples from the tree we have in front of the house, jellies and even froze vegetables. Especially for times like this. So when I came home today and felt like eating something sweet after dinner, I opened a bottle of applesauce and had some with ice-cream. It made the snow we are expecting tonight (2-3 inches) easier to digest! Cut and quarter the apples and cover them with lemon juice. I left peels on some of the apples to test the texture. Then put the apples in a large pot with the rest of the ingredients. Bring it to a boil and then lower heat and simmer for 30-40 minutes till it gets all soft and mushy. Remove the cinnamon, cloves and adjust sugar. Then take it in batches and mash or put it in a mixer. Filmmaker Paromita Vohra was in town this weekend as part of a series on Indian cities in the global era (link), and we had a chance to chat with her over brunch at our place this morning. 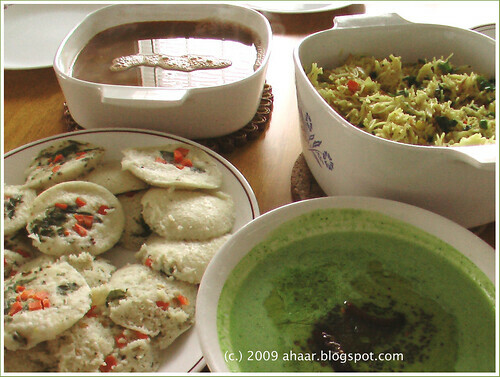 Brunch - rava idlis, shavige bath, crisp dosais, okra sambar, and tencha - of course, extended well into the afternoon with several cups of tea and coffee! 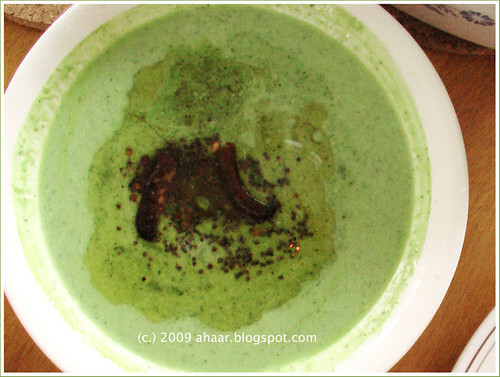 Instead of chutney or thikkat meet (spicy gunpowder/milagai pudi), we decided to try what tanjore marathis call tencha - a tangy yogurt-cilantro sauce. It's easy to make and if you ask me, well with just about anything! Chop cilantro, and grind to a paste with green chilis, ginger, and garlic and salt. Mix it with yogurt and make it to sauce. Now heat oil and temper it with mustard seeds, urad dal and serve. It went well with both idlis and shavige bath. These days are so cold that every room in the house feels cold. So I prep for simple dinners which we can eat with the heater running. And in this winter season this recipe has come in very handy. I don't know how I came upon this recipe. We tried it for the first time during the holidays and since then we have been eating it once a week. It's quick, the dressing is simple and goes really well with the spicy chicken and the veggies. 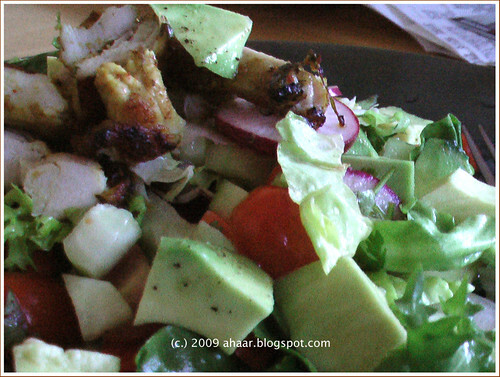 And the creamy avacado is a perfect foil for the tandoori style chicken. I end up using whatever vegetables are in the fridge. I've used carrots, different kinds of greens, fresh peppers and they all go well with the salad. 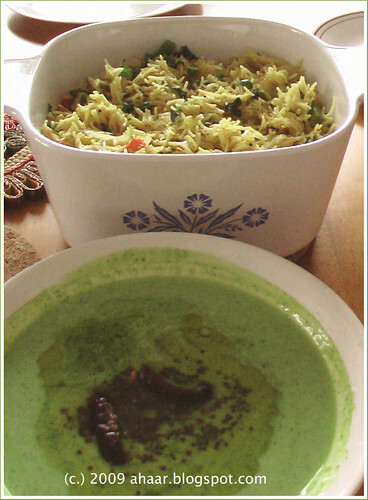 Alternately, you can also substitute chicken with smoked fish, grilled paneer or tofu. Marinate the chicken and let it sit for 2-3 hours. If you can leave it overnight, the chicken is really soft and tender once done. Preheat the over to 400degF. Then put the chicken on a foil on a tray and cook each side about 10-15 min till completely cooked. Slice up the vegetables in the meantime and mix them in a salad bowl. 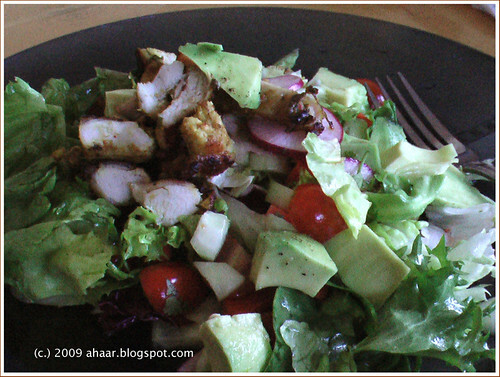 Make a dressing out of lemon juice, olive oil, salt, cumin seed powder, and fresh ground pepper. Cut the chicken into bite-size pieces and add the dressing. It tastes best when the chicken is warm. This is going to Monthly Mingle: Healthy Family Dinners being hosted by Michelle at What's Cooking. Meeta at What's for Lunch, Honey is the creator of Monthly Mingle :) Great job, ladies! You think this is gulab jamun? Well, this is like gulab jamun, except that it is made with sweet potato and coconut. And it's call Ranga alu pithe. I was on the phone talking to my mom when she mentioned that Sankranti is this week. Sankranti is a harvest festival celebrated in many parts of India on the 14th or 15th of January. 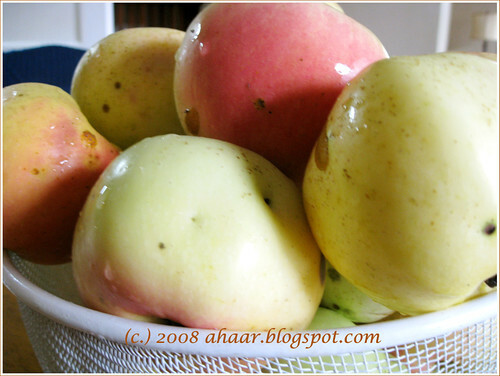 And since this is a harvest festival, different parts of India make various delicacies with seasonal produce. In Bengal, this is the time to make pithes. Different kinds of pithes with rice, coconut, palm jaggery, sweet potatoes, milk, cream in different combination. On phone with her, I remembered all the pithe I had when they were visiting. 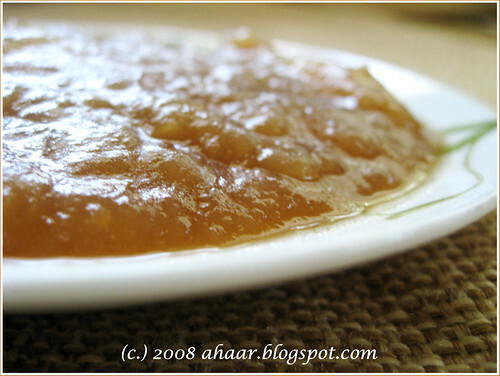 My mom had made Ranga Alur Pithe when she was here and there wouldn't be a better time to post the recipe. 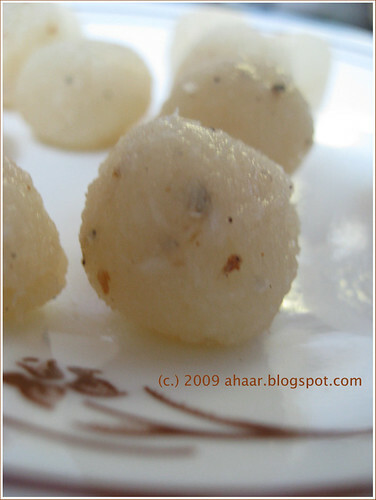 She had made them for diwali and the kids particularly enjoyed the little secret in the middle of each pithe. This is sweet potato dumpling filled with coconut in the middle, fried and then dunked into a sugar syrup which has been flavored with cardamoms. I was eating them after ages, so they were a fantastic treat! Boil the sweet potato till it is soft and mushy. Peel the potato once its cool and then mash it up. Add the flour to the potato mash and set aside in the fridge for 30 min to an hour to allow it to set. In the meantime, heat a thick bottomed pan and add the frozen coconut and sugar and cook on medium high heat. Let the sugar and coconut cook to a mix. Once the coconut and sugar are well combined take a tspoon of the mixture and make a small ball to see if it holds shape. If its holds shape, add the powdered cardamom to this mixture and set aside to cool slightly. The syrup should be made earlier and kept warm. Add 2 cup of sugar to a cup of water and let it come to a boil. The add the cardamoms and the saffron strands and let it cook on medium heat for 5-10 min. It shouldn't be too thick. Now get the potato mash out of the fridge. Divide the potato mash into equal small balls, make a depression in the center and place the coconut ball inside Then cover it into a round. 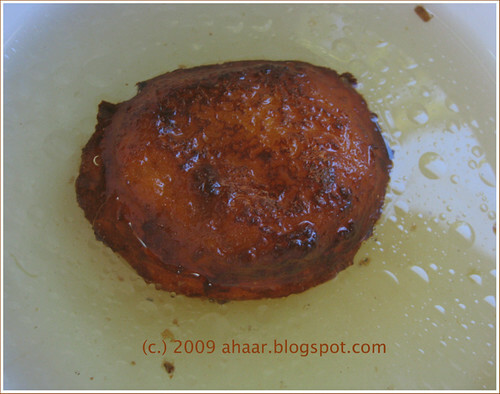 Heat the oil in a wok and deep fry the balls till they turn golden brown. 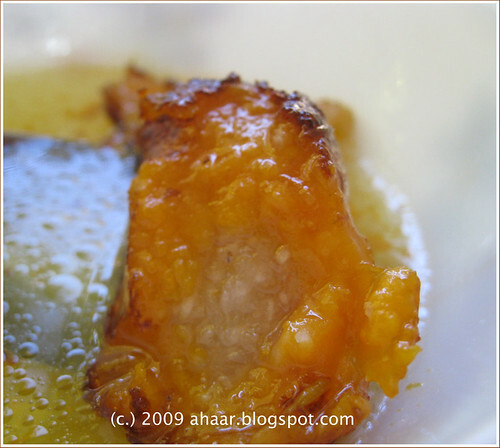 Now, soak deep fried sweet potato and coconut balls in sugar syrup. Before I know, the first week of the new year is gone. Getting back to work after the long break somehow left me little time for anything else other than The Wire. As I had mentioned before, we have been watching The Wire (HBO series). So this week, when it was time to go back to work, we were on the final season, so all we could do after getting back from work was to watch the next episode. It is one of the most intense cop drama series I have seen in a while and the fact that everything doesn't tie up nicely at the end makes it all the more interesting. We finished the series on Friday and somehow, we feel that there is so much time on hand :) I am also looking for recommendations for television series. I am a big fan of aloo kumror chakka (potato and pumpkin sabzi) and as soon as the fall/winter season arrives, I make it fairly regularly with pumpkins and butternut squash. 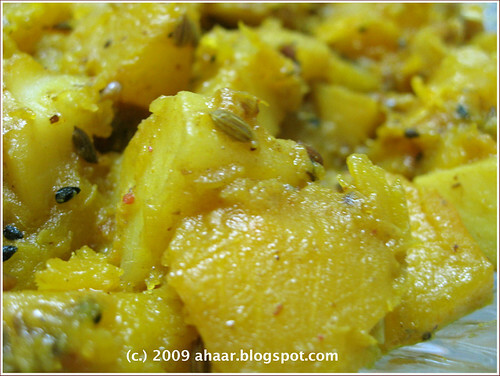 I made this potato and butternut squash sabzi this week and we had it for dinner with roti. The subtle flavor of panch phoron only enhances the butternut squash and potato combination and goes well with either rice or chapati. 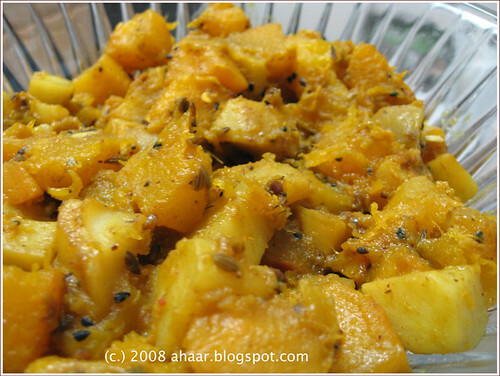 Wash and cut the butternut squash and potatoes in small cubes. 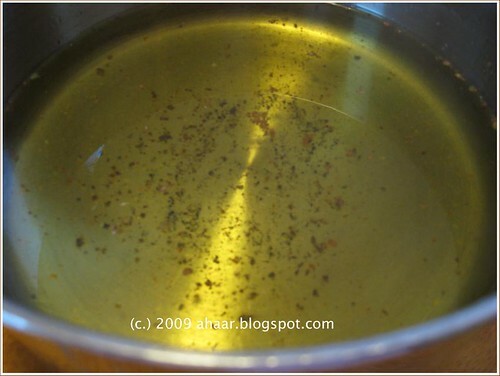 Heat oil in a pan and temper it with panch phoron, chillies, and grated ginger. Then add the potatoes and let it fry for 2-3 minutes. Then add the butternut squash and let it cook on medium heat and closed lid for 3-4 minutes. Add all the masalas and salt in with little water (about a few tbspoon) and mix it well. Cook it cook on medium heat and closed lid for another 7-8 min or till the potatoes and butternut squash are fully cooked and there is no water. It has been a while since I posted anything to the Healthy Sabzi Series, so here is a new addition. The vegetable ofcourse is butternut squash, which has high amount of beta carotene and a good measure of Vitamin C and fiber. More here.